Chromebooks are portable lightweight computers that connect students wirelessly to their SD61Learn accounts. 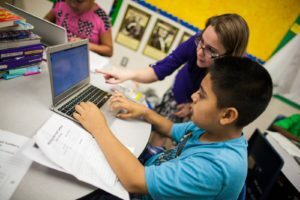 Chromebooks are an ideal solution for a wide array of student learning needs. The Chromebook platform facillitates a collaborative learning environment with the G-Suite platform of software tools that includes: Docs, Sheets, Forms, Sites, Hangouts, Chrome, and more! Gone are the days when you had to remember which was the last computer you used as a student can login to their accounts from any machine and pick up where they left off at their last session. Please note that a Chromebook is not a laptop. The benefit of a Chromebook is that it is low cost, light solution to a cloud based laptop. There is no software or files that are stored on the Chromebook. This facilitates the need to have it as a shared device as an option for anyone in the classroom. A Chromebook can work nicely with other mobile devices, like iPads, because it relies on the G-Suite for Education platform which is available for free on almost all major app stores. Please view our product page for more specific information on the Chromebook itself. 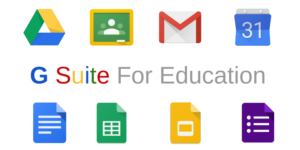 Please view our G-Suite resource page for more information about these powerful tools including Google Read & Write and Team Drives.